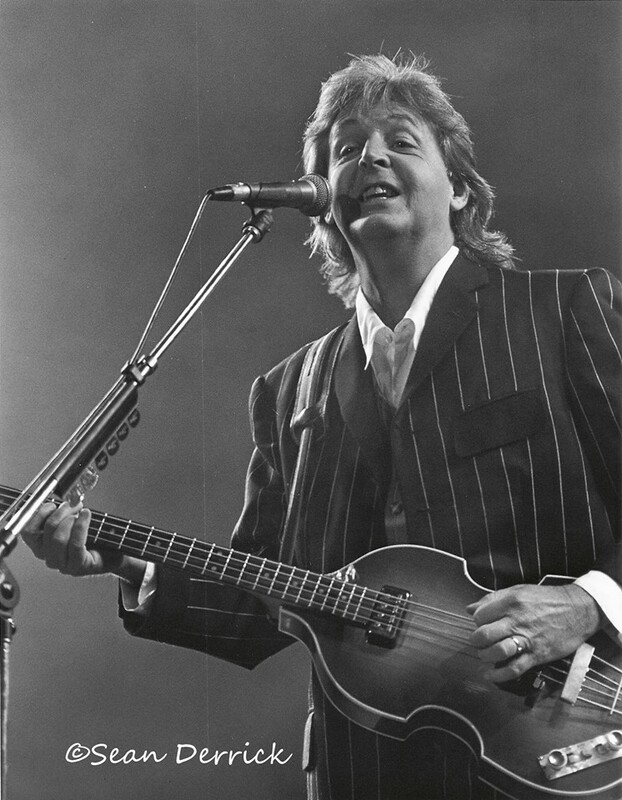 Paul McCartney performing at Busch Stadium in Saint Louis April 29, 1993. Photo by Sean Derrick/Thryd Eye Photography. Welcome to From The Vault, a place where I will publish previous reviews from concerts I did while working at various newspapers (and prior to the internet), and previous shows from now defunct online sites. My main focus right now is for the reviews that were published before the internet. Due to current market conditions and budget constraints the newspapers have my stuff low on the totem pole of archived things to post online. So, I will help them on this endeavor. 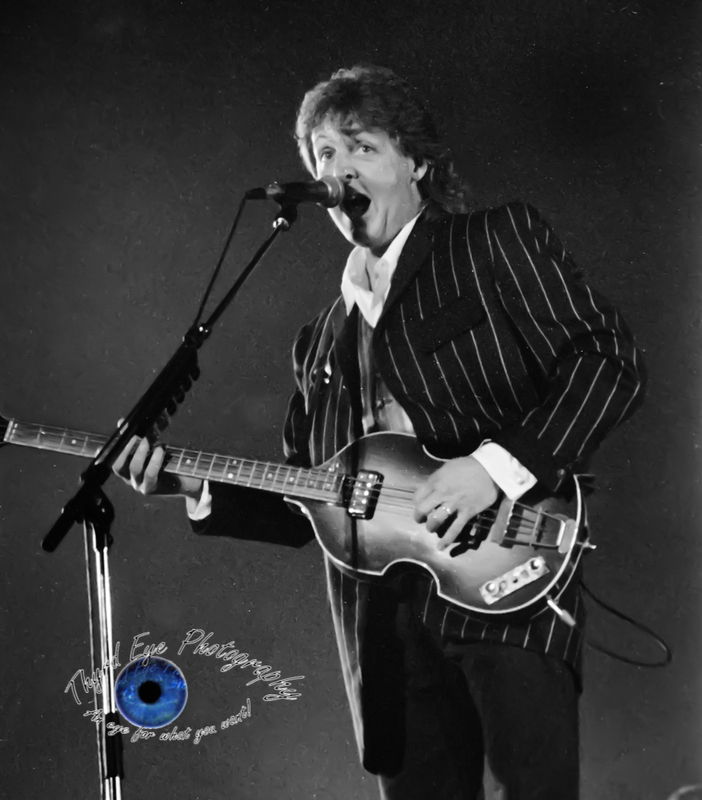 First up is my review of Paul McCartney’s first solo appearance in Saint Louis 25 years ago today on April 29, 1993, and only his 2nd overall up to that time. His first show was in August 1966, just eight days before their final show in Candlestick Park (Their 5th to last show ever, not counting the Rooftop concert for “Let It Be”). For the Beatles’ show it was a very rainy night and only 23,000 showed up for the Fab Four’s only Gateway City gig at the newly opened Busch Memorial Stadium. The stage setup was abysmal, with rain dripping down onto the amplifiers from corrugated iron that was hastily put together. This gig was famous for convincing McCartney that the Beatles should cease touring altogether. It was, to say the least, a miserable time for the lads from Liverpool. Fast forward 27 years and McCartney was booked for a return gig at the same stadium that was the death knell for the Beatles’ touring. This time, it was a lot more fun. I was used to being the only photographer in the pit for most shows, or sharing it with maybe one other person. For McCartney there were a couple dozen more and it felt cramped. Top that off with the fact that they kept us to the last 1/3 of the stage on stage left. So, we had to pick a spot and not move. Thankfully my spot was free of stage monitors so I had a clear view of Paul, not so much of the rest of the band, though. 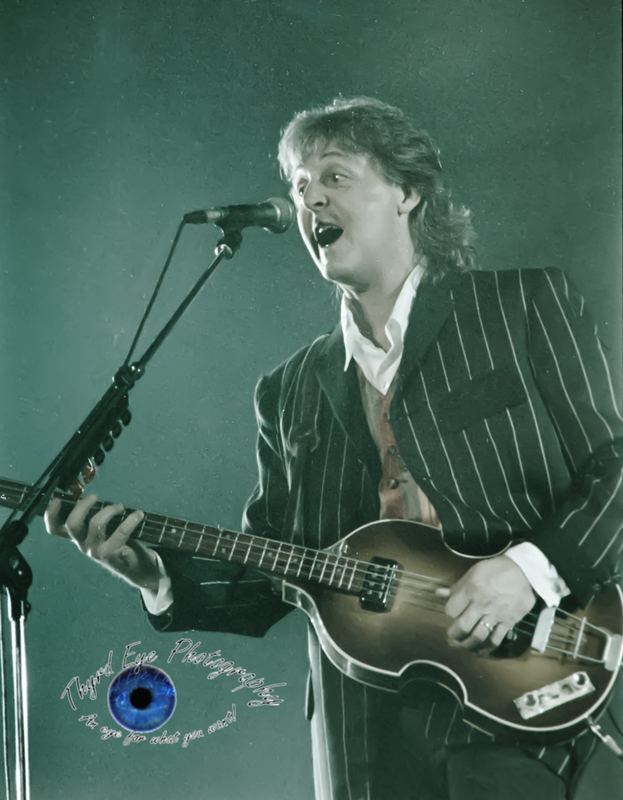 I didn’t mind, though, as I was there for one reason: Macca. One last note: We, as photographers, usually get a pass indicating we are with the media. And we collect the passes, as our “badge of honor” if you will. I still have all of my passes, except this one. It was noteworthy in the fact that for this show the PR person collected all of our passes. Begrudgingly, I gave mine back, disappointed that I would not get to keep what was, at the time, my crowning achievement. Thank you for reading, and I hope you enjoy the first of many FTV stories. Be sure to check out the photo gallery after the setlist. Remember, these were taken with a Canon film SLR, (Yes I shot Canon back in the day, before switching to Nikon when I made the leap to digital) and the film reflects a quarter century of handling, with all the grit and wear that comes with it. I think it adds a little something to the historical perspective, don’t you think? When Paul McCartney played St. Louis’ Busch Stadium last Thursday it mared the first time that he has played in the Gateway City since the Beatles played at the same stadium in 1966. This time, Paul is on his “New World Tour” to support his lattest LP Off The Ground. 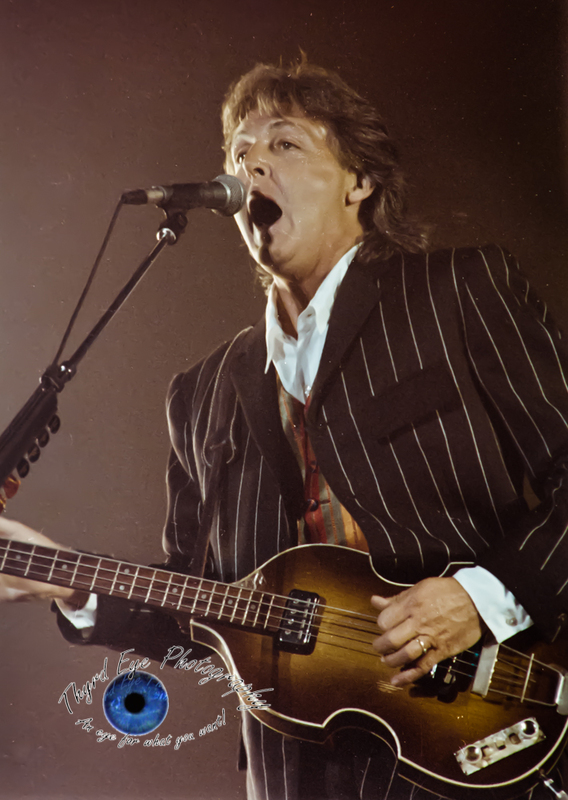 After a 12- minute film, mainly on Paul’s life, with “Help!” and “Helter Skelter” among the songs piped through the sound system, he and his band came out to start the show with “Drive My Car”, the first of his 18 Beatles songs that he performed that evening. “Peace in the Neighborhood” crawled in next, but Paul rejuvenated the crowd with his current single, “Off the Ground”. Paul’s band (guitarist Robbie McIntosh, guitarist Hamish Stuart, his wife Linda on keyboards, keyboardist Wix, and new drummer Blair Cunningham) didn’t shy away from the classic sound as they ripped into a stellar version of “Can’t Buy Me Love” before doing a fantastic acoustic set consisting of “Good Rocking Tonight”, “And I Love Her”, and “Be With You”. But “Hope of Deliverance” (The first single off the new album) and “Michelle” stood out above the rest. McCartney got an eruption from the crowd when he asked “How about those Blues?” (Did he really watch the Blues eliminate the hated Blackhawks just four nights prior? Either way, good call Mr. 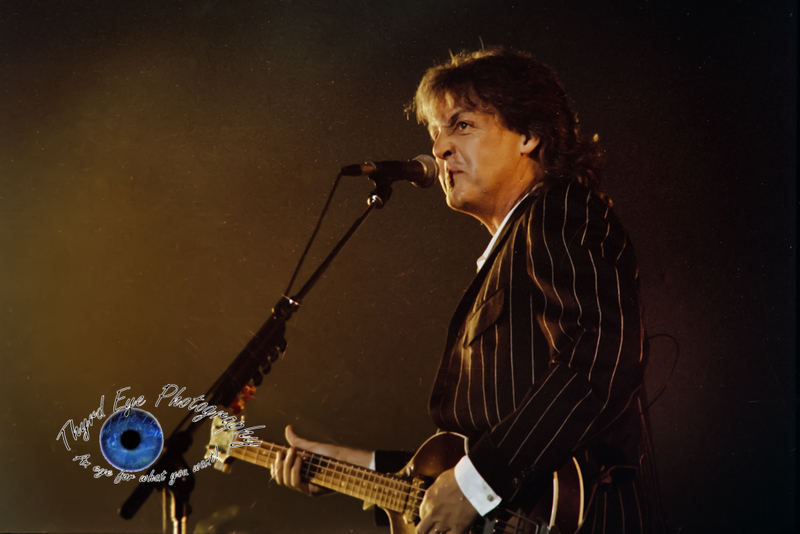 McCartney!) before hitting a wonderfully done “Biker Like an Icon”, which should be the next single, if anyone cared to ask me. He slowed things down again with “Here, There and Everywhere”, “Yesterday”, and “My Love” before rocking again with “Lady Madonna”. By that time a fog was really settling around the stadium. This though, provided for spectacular viewing of the excellent light, laser, and pyro show on “Live and Let Die” (Axl Rose, eat your heart out). Even though one could barely see the fireworks going off above the stadium the explosions and pyro on the stage were breathtaking. By the time Paul ripped into “Paperback Writer” the crowd was back on its feet while 50 foot “paper” manuscripts floated above the stage to present a very cool visual. The stage itself was sight to behold, claiming to be the biggest ever assembled at Busch Stadium. Rising 100 feet off the outfield, spanning 300 feet across, with nine huge video screens, it was a far cry from the little 15’ by 15’ platform the Beatles’ played on in 1966. 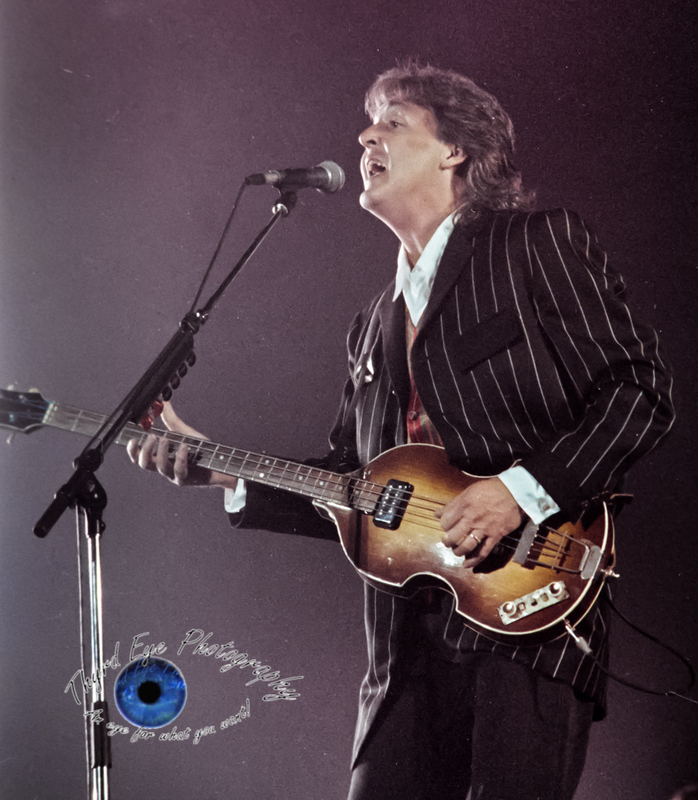 One particular song was noteworthy in that this tour marks the first time the Beatles’ “Fixing A Hole” has been played live. Paul kept the Sgt. Pepper’s Lonely Hearts’ Club Band theme going with a rocking title track, interwoven with some pretty impressive guitar solos from Paul and Robbie. All throughout the show Paul acted more like 25 than 50. For the encore, Paul came out waving a Missouri flag and performed “Band on the Run”, a very intense version of “I Saw Her Standing There” before finishing off with a 10-minute version of “Hey Jude”, complete with the obligatory four-minute audience participation. 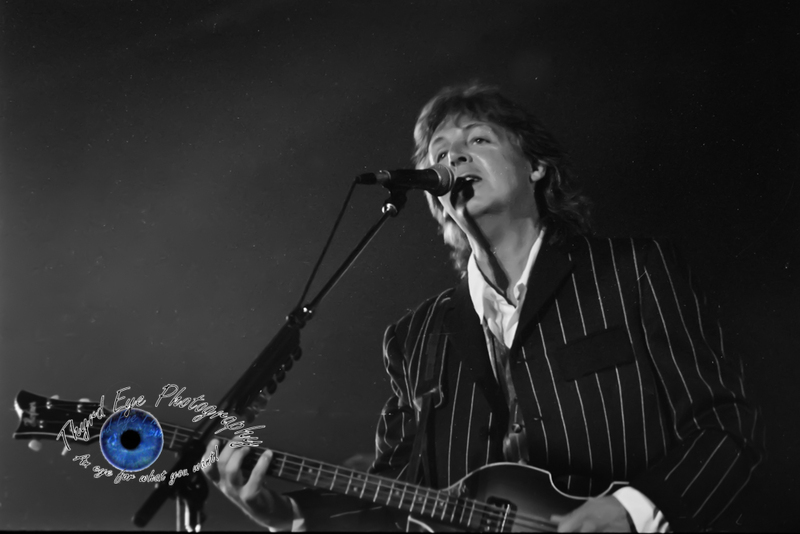 Throughout the show Paul’s voice sounded crisp and his band was spot on tight. Unfortunately, the show ended, but not before 33 songs were played over 2 and a half hours. I am not going to say “but where was this song, or that song?” because it would have added a few more hours just to make everyone happy. But I think it is safe to say he pleased just about everyone with a great performance and just simply coming back to Saint Louis. I certainly hope he doesn’t wait another 27 years to grace Saint Louis with his presence again.